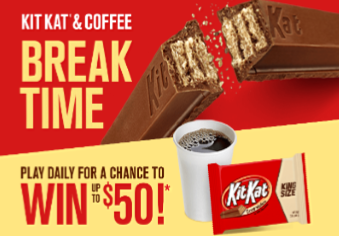 Kit Kat Break Time Game IWG – Win a $50 PayPal Reward! Win a $50 Paypal Reward (100 winners)! ENTER SWEEPSTAKES HERE – Kit Kat Sweepstakes page. ENTRY LIMIT – Limit one (1) Play per name per e-mail address per day during the Game Period. ELIGIBILITY – Game open only to legal residents of the fifty (50) United States and the District of Columbia who are eighteen (18) years of age or older at the time of entry. SWEEPSTAKES ENTRY PERIOD – GAME BEGINS AUGUST 10, 2018 AT 12:00:01 PM EASTERN TIME (“ET”) AND ENDS DECEMBER 31, 2018 AT 11:59:59 PM ET. (d) Third Prize: There will be four thousand (4,000) third prizes (each a “Third Prize”) awarded in the Game. Each Third Prize is a $5 PayPal Reward, with an ARV of $5. WINNER’S LIST – For the first initial, last name, hometown and state of the prize winners, mail in a self-addressed, first class-stamped envelope to: KIT KAT® Break Time Instant Win Game, PO Box 251328, West Bloomfield, MI 48325. All requests must be received by March 4, 2019.